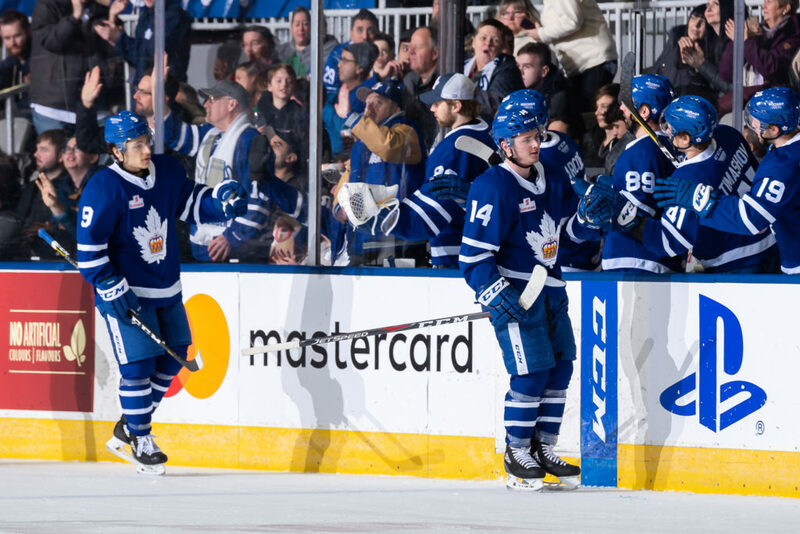 The Marlies and Thunderbirds met Saturday evening for the first time this season and both teams came out hungry as they looked to get back in the win column. The Thunderbirds struck first with an early goal from Jonathan Ang. Ang’s fourth of the season came just 1:39 into the opening frame and was assisted by Jamie McGinn. The Marlies saw an opportunity on the man-advantage at 15:06 as Springfield’s Matt Marcinew was called for high-sticking. 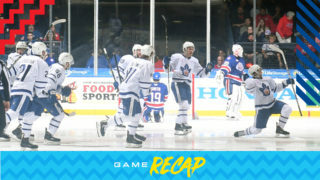 The Marlies were unable to convert on the ensuing power play and the game returned to even strength. Gabriel Gagne got the Marlies on the board at 17:13, finishing off a nice passing play from Adam Brooks and Dmytro Timashov. The goal was Gagne’s fifth of the season and first with the Marlies. Thomas Schemitsch restored Springfield’s lead at 4:20 of the second from McGinn and Paul Thompson. Minutes later, Schemitsch was called for high-sticking, giving the Marlies an opportunity on the power play. 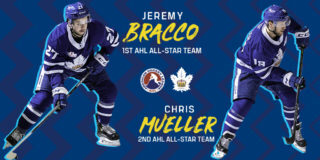 They converted less than a minute into the man-advantage as Jeremy Bracco found Chris Mueller on the doorstep and he made no mistake banging home his 23rd of the season. Calle Rosen picked up the secondary assist on the goal, his 32nd of the season. At 15:47, Adam Brooks gave the Marlies their first lead of the night as he and Trevor Moore converted on a shorthanded 2-on-1. The eventual game winner was Brooks’ first professional shorthanded goal. Both teams combined for nine shots in the third in a tight defensive battle. In the final minutes of the frame, Samuel Montembeault left his post between the pipes to make way for an extra attacker. Pierre Engvall scored on the empty net to seal a 4-2 win for the Marlies. Bracco and Mueller assisted on the empty-net goal. The Marlies are back in action tomorrow to host the Belleville Senators for a 4:00 PM start at Coca-Cola Coliseum. Gabriel Gagné scored his first goal for Toronto at 17:13 of the first period. 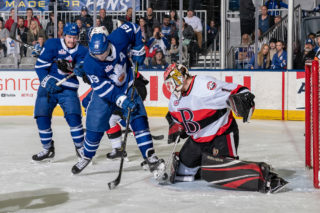 Gagné previously scored in Toronto’s shootout win over Belleville. Gagné has 11 points (5 goals, 6 assists) through 42 games this season. Chris Mueller scored on the power play at 7:56 of the second period and later added the secondary assist on Engvall’s empty net goal in the third period. Mueller has scored 11 power play goals this season. Mueller has eight points (4 goals, 4 assists) in his last five games. Adam Brooks scored the game-winning goal shorthanded at 15:47 of the second period. He earlier added the primary assist on Gagné’s first period goal. This is Brooks’ first professional shorthanded goal and his third game-winner this season. Pierre Engvall scored an empty net goal at 19:05 of the third period. Engvall has 20 points (12 goals, 8 assists) through 44 games this season. This was his first empty net goal of the season. Dmytro Timashov recorded the secondary assist on Gagné’s first period goal. Jeremy Bracco registered the primary assists on Mueller’s second period power play goal and Engvall’s third period empty net goal. This is the 13th game where Bracco has recorded two or more points (8-27-35). Bracco has four points (1 goal, 3 assists) in his last two games. Calle Rosen had the secondary assist on Mueller’s second period power play goal. Rosen leads all defencemen in assists (32). Rosen has recorded an assist (7) in five consecutive games. Trevor Moore picked up the lone assist on Brooks’ second period shorthanded goal. Moore has six points (1 goal, 5 assists) in four consecutive games. Michael Hutchinson stopped 28 of 30 shots he faced. Hutchinson is now 7-3-3-1 on the season with a .899 Save Percentage and a 3.23 Goals Against Average. Toronto went 1-for-1 on the penalty kill and 1-for-5 on the power play. Springfield had a 30-28 edge in shots in all situations. Chris Mueller led the Marlies with five shots on goal. 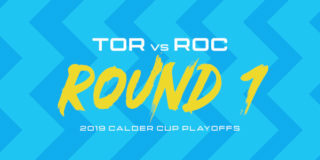 The Marlies are 6-3-0-0 against Atlantic Division opponents and are 1-0-0-0 against the Thunderbirds. The Marlies are 6-3-1-0 when tied after the first period and 18-0-1-1 when leading after the second period. Toronto is 10-8-1-2 when outshot their opponent. The Marlies are 9-5-0-0 in Saturday games and are 3-0-1-0 in February. Jeremy Bracco has recorded points (1-3-4) in consecutive games. Adam Brooks has recorded points (1-2-3) in consecutive games. Trevor Moore has recorded points (1-5-6) in four consecutive games. Chris Mueller has recorded points (4-4-8) in five consecutive games. Calle Rosen has recorded assists (7) in five consecutive games. I liked it a lot. It was a hard game tonight, that’s a very competitive team. They play fast, they come at you really hard, they are hungry on the puck and they go to the net hard and all those types of things so, really required our team to dig in, not only because we were from behind, but just the way the game was going and I thought we responded very well. Well I think a lot of it was the fact that we were able to earn power plays. They were coming hard early in that second period and we were able to draw some penalties and play on the power play and that allowed us to I thought, turn the game. I thought that was going to be a significant factor, not only because it kept their power play off the ice, the power play is the reason they win a lot of games. Also, they draw a lot of penalties, by far more than any team in the league, so our ability to stay out of the penalty box I thought was going to be a big factor in the game. We did that and drew our own power plays and made good on one and then when we had to kill we were able to score. Can’t ask for much more than that. I mean he was he was a very significant contributor for us in the playoffs last year as all our players were, but he was one guy I thought was just going to take a real big step this year – he and Bracco both. Those are the two incoming players last season and they played different roles for us last season, but I expected both to be big parts of our team this year. Brooks unfortunately got off to a tough start, with some injuries that set him back a little bit. But I just thought he had a really great training camp with the Maple Leafs and was set to get going and then he had the setback but he seems to be in a groove here now. 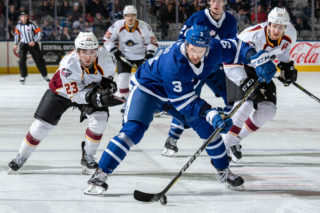 The Toronto Marlies (24-16-4-3) return to action today to host the Springfield Thunderbirds (21-19-6-4) for a 4:00 PM start at Coca-Cola Coliseum. This marks the first meeting between these two teams this season. 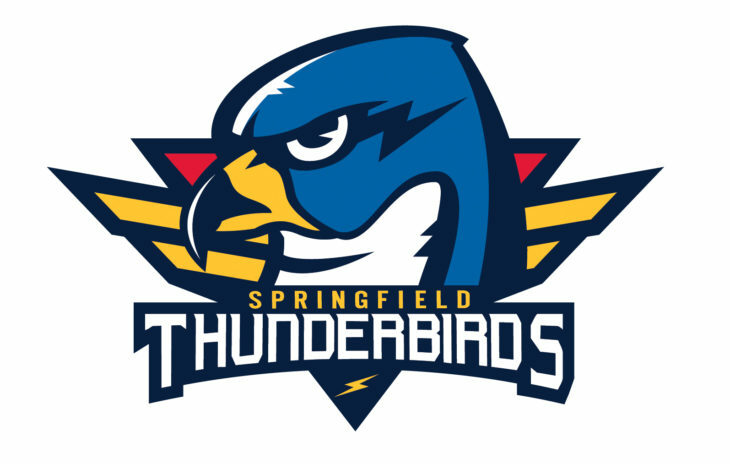 The Thunderbirds currently sit sixth in the Atlantic Division and 10th in the Eastern Conference while the Marlies sit third in the North Division and sixth in the Eastern Conference. Both teams will be looking to get back in the win column after suffering losses in their last game. 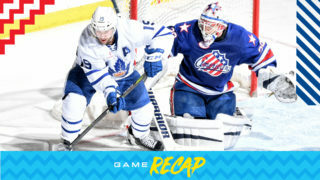 The Thunderbirds dropped a 7-1 decision to Rochester and the Marlies were edged by Belleville in overtime. Coming into tonight’s game the Thunderbirds are riding a three-game losing streak and have dropped four of their previous five while the Marlies have won three of their last five and six of their last 10. Players to watch: Chris Mueller leads the Marlies with 47 points (22 goals, 25 assists) and sits third among AHL skaters. Jeremy Bracco is not far behind with 45 points. His 32 assists place him third among AHL Skaters. Mueller and Bracco have displayed great chemistry this season and continue to see success when they’re on the ice. Harry Zolnierczyk leads the Thunderbirds with 40 points (nine goals, 31 assists) and has three points in his last four games. It’s Star Wars Night at the Coliseum tonight and fans are encouraged to dress up and arrive early to receive a Marlies Star Wars poster and to meet their favourite Star Wars characters in Marlies Alley before the game. Today’s Star Wars game is also in support of SickKids and $5 from every ticket sold will be donated to the SickKids Foundation.